There is a very important step when installing Siding. The insulation. 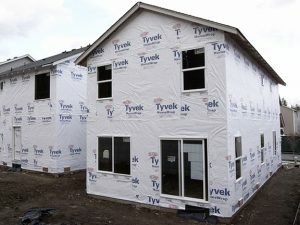 The Insulating house wrap should not be overlooked when asking for a quote. R-value measures the effectiveness of insulation. The higher the R-value, the more resistance a material has to the movement of heat which has homes become more comfortable and energy efficient. The house wrap that is applied should always have an air infiltration barrier, if this is not included it could trap moisture which would lead to mold or dry rot. Tiny breather holes allows moisture to evaporate, keeping the home dry. Another added benefit is that it acts as a sound barrier because of the added layer of foam. if you experience any of these issues, give 1st Choice Home Solutions in London, Ontario a call! 519-268-6331 for a free estimate, or use our contact us page.